This is our niece, Jennifer, shopping for fabric over the July 4th weekend for her three classes at the Mid-Appalachian Quilters Conference. One of the classes involved making a quilt sampler comprised of four lopsided log cabin type blocks. 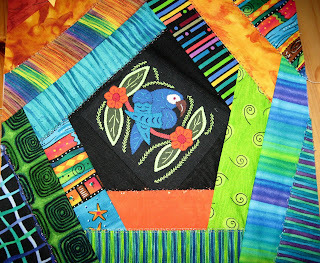 Each block was to have a fussy-cut or embroidered fabric for its center, and Jenna decided to use small molas for her centers. These molas came from Priscilla's most recent trip to the San Blas Islands in Panama. 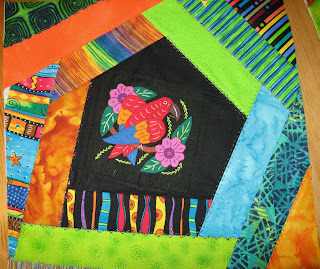 We cut strips of some colorful fabrics from the stash closet for her to use in class to coordinate with the molas. Here are two of the completed blocks.... I think the finished sampler is going to be terrific!